Genres are clearly not something Avicii adheres to with his electric dance album True. At 24, Swedish born DJ Avicii has got the EDM world, and beyond, in the palm of his hands. Everyone wants to hear more from the man who released one of the biggest EDM anthems in recent years, ''Levels'', back in 2011. The song earned the DJ a Grammy nomination, and helped propel him out of the EDM world, towards the ears of the masses. He became the first DJ to headline Radio City Music Hall in New York, not just once but on two consecutive nights, with the latter selling out in less than a minute. Avicii is hot property, and his debut album, True is only going to ensure that he maintains this status for the foreseeable future. The album opens up with the guitar riffs of ''Wake Me Up'', which will, for many, be a tune that takes them back to the summer. It's probably the catchiest song on the album, but it also sets a precedent for what one can expect from the other tracks. ''Wake Me Up'' isn't, or rather, wasn't, a track you would expect from an EDM artist. While the EDM elements are clearly there, the track was built on a melody that could be found on a standard country or folk album. On top of that are the sultry tones of R&B singer Aloe Blacc. It's a song that effortlessly darts across genre lines, a concept that is embraced throughout the album. Comparisons between Avicii and David Guetta have been numerous, and will continue to occur as long as both are producing hit after hit. However if there's ever one thing that will set them apart, it's the artists that feature on their songs. Firstly, Avicii doesn't give these artists a feature spot, unlike Guetta. If you want to know who the artist is, you have to check the track notes. Secondly, while David Guetta consistently collaborates with some of the hottest artists in the charts, you would be forgiven for only knowing a few of the artists credited on Avicii's True. The singer on ''Dear Boy'' could easily be confused for Lana Del Rey, but it's actually Danish singer MØ. There's also help from various Swedish counterparts. The second single from the album, ''You Make Me'', features Salem Al Fakir -- who also contributed to ''Silhouettes'', a follow-up single released after ''Levels'' -- as well as Vincent Pontare. Swedish artist Linnea Henriksson also delivers some gorgeous vocals to a cover of ''Hope There's Someone'', originally by Antony and the Johnsons. People can be very protective of the original versions of songs, especially one as beautiful as this, but if a house version is going to be done, Avicii is one of the best to do it. There are also some very high-calibre artists featured on the album. Nile Rodgers is unmistakable in the uptempo, jazz infused song, ''Lay Me Down''. If there was ever a song that should have been added to The Great Gatsby soundtrack it's this. It also features vocals from folk rock singer Audra Mae, who happens to be the great-great-niece of Judy Garland. Mac Davis is another heavyweight legend who lends his expertise to the album. Having written some of Elvis Presley's biggest hits, including ''A Little Less Conversation'', as well as having a successful solo career, his hand on ''Addicted To You'' further intensifies the country influences that pervade the album. The wide range of artists that appear on the album could cause it to become a jumbled mess, but Avicii handles each different sound and style perfectly. There's a mixture of the unknown, and the legendary and together they're all helping to create a fresh sound, with Avicii at the helm. Avicii takes his listeners on a journey with True and he brings it to a fitting end with ''Heart Upon My Sleeve''. The song was originally released with vocals from Dan Reynolds of Imagine Dragons, but while the album version still credits the band, the it doesn't contain the vocals. There will certainly be people disappointed at this move, but quite frankly, it's one of the standout tracks on the album. The genre crossing is still there, but the lack of words will remind listeners that Avicii is first and foremost, a European house DJ. It's also how he chooses to end the iTunes version which has two additional tracks. The eight-minute long finale, ''Edom'' again, shows Avicii returning to his roots. 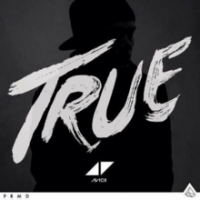 True is an album that takes one type of music and moulds it into something completely different, allowing Avicii to cement himself as one of the best DJs in the world.